Ken Sean Carlson. He is the object of Poppyseed’s desire. At least as far as her make-believe world is concerned. Yes, my seven-year-old daughter is actually a teenager shoved into a tiny, lithe body. FrumeSarah: Do you even know what that means? But “really cute” is in the eye of the beholder. For the first time, I understood why ethnic dolls are important. They reinforce ethnic and cultural identity. I look at Ken and am left cold. Where is the dark haired, glasses-wearing, kippah-toting fashion doll?? Not only do they “reinforce ethnic and cultural identity”, but gender roles as well. But what should I expect from Barbie in the first place? Yeah, I figured that would be the bothersome point for some. I’m a throw-back to a different era. I still like the romantic fairy tales of my youth and the idealized fantasy of being saves by the charming prince. I think I am living proof that liking those stories has in no way affected my strength and fortitude as an independent, free-thinking woman. That is NOT what Poppyseed told me. She said that she wanted a boy Barbie so that Beernut would play Barbies with her. I bet they are both true. 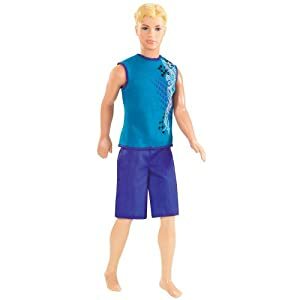 Anyway, the first Ken I picked out, while still white, did have brown hair. It was one of the Fashionista Kens, but I was so bothered by the hairstyle that I couldn’t bring myself to actually buy it. And there were only four different Kens available where I went, probably since I was in Vermont. Anyway, I certainly wouldn’t expect Mattel to make a doll that caters to .22% of the world population. The real question is why there aren’t more Asian Ken dolls.